We’ve been rewatching and rating Leverage and we’ve gotten up through season 4. (For more on how our rating system works, see here, which also covers season 1 of Leverage.) Here’s what we thought. 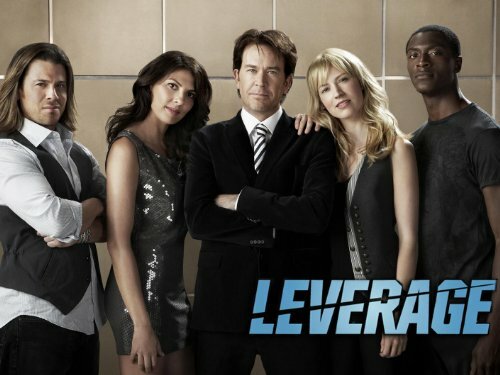 Leverage goes out on a high note with an average rating of 6.6 for its final season, a small step up from 6.4 for season 4 and the best of any season. There are a mix of better and worse episodes this season, including a couple of real duds, but there’s a slew of 9s and 10s that just sparkle. This season has a mix of traditional con procedurals and more ambitious episodes that break out of the formula. The best episodes include both perfectly executed traditional grift stories and some of the more unusual attempts. The effort to do something different doesn’t always pay off, though, and this season’s failures are some of the episodes that stray farthest from the formula. The absolute worst of the season—and in the running for worst of the entire series—is “The D. B. Cooper Job,” at 1.5, which, like season 4’s “The Van Gogh Job” is mostly about other characters played by the main cast, this time reinventing the story of skyjacker D. B. Cooper. While “The Van Gogh Job” had the advantage of a charming, if sad, love story, “The D. B. Cooper Job” is just a whole lotta brooding white guys being emotionally unavailable and stuff, which is pretty much the last thing we need more of on tv. Dishonorable mention also goes to “The White Rabbit Job,” at 3, which tries to do an Inception and seriously fails to pull it off. Happily, we have three standouts tied for best of the season at a full 10 points. “The First Contact Job” is a kooky X-Files riff with a faked alien contact and tons of tongue-in-cheek sci-fi geek humor. “The Broken Wing Job” is a solo adventure for Parker (our favorite character!) which challenges her to figure out how to do the work of the whole team while recovering from a broken leg. Watching Beth Riesgraf play the whole range of Parker’s emotions from climbing-the-walls stir-crazy to oh-no-you-don’t-hurt-my-friend badass is a sheer delight. Finally, “The Rundown Job” trades in the series’ usual quirky humor for an action-packed bioterror thriller in Washington D. C. with just Parker, Hardison and Eliot (our three favorite characters!). And that’s Leverage! A lot of good episodes and great characters. Well worth a rewatch! Any Leverage fans out there want to weigh in? Got a different pick for the best or worst episodes of the season? Let us know in the comments!